The bail granted Mazi Nnamdi Kanu's co-defendants in the persons of Benjamin Mmadubugwu, David Nwawuisi, Chidiebere Onwudiwe and Bright Chimezie on the 25th of June 2018, by Abuja-based Federal High Court presided over by Justice Binta Nyako, is not just only ridiculous and unacceptable but inhuman and callous. It is true that they are no more under the confines of Kuje prisons but the stringent conditions attached to their bail proves otherwise. The ruling of Muhammadu Buhari's puppet Judge, Justice Binta Nyako even in this 21st century is quite detestable. In civilised societies like Britain, United States of America, Russia and Germany to mention just a few, such legal antecedent as practiced in Nigeria even in a supposed democracy, is a taboo. Such legal betrayals are not surprising because they are parts of fulfillment of the prophesies given years back by Mazi Nnamdi Kanu, the indefatigable and courageous leader of the Indigenous People of Biafra (IPOB) worldwide. Therefore expecting the converse in a contraption like Nigeria is grossly misplaced. * No acceptance or conduction of any form of press interview. * Must not participate in any rally. * Must only travel out of their domain on court approved dates. * Must report to State Commissioners of Police fortnightly as stipulated. The above outlined conditions amongst others attached to their bail, clearly depict judicial rascality and contempt of the United Nations law governing self-determination of indigenous people groups. 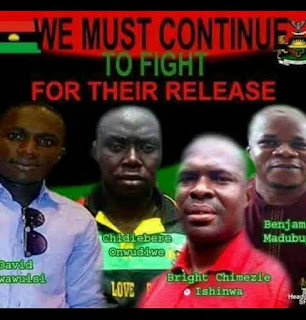 Justice Binta Nyako is fully aware that these Biafran agitators are innocent of the cases respectively levied against them which prompted their extra-judicial incarceration in Kuje prisons for close to three good years. There existed no evidences despite the many antics of the Nigerian government, to justify before the law, their persecution. The charges put forward by the prosecuting counsel were not only frivolous but gravely misleading and inhuman. In a sane society, Benjamin Mmadubugwu and his brethren ought to have been released unconditionally, duly apologised to and adequately compensated by the Nigerian government but alas, such cannot be in a shamelessly tyrannic and Islamic driven country like Nigeria, where human rights are brazenly violated at will. Justice Binta Nyako was only used as a puppet to play out a script written by the despotic President of Nigeria, Muhammadu Buhari. The once enlightened and vibrant legal professional, was thus used to play out a dirty game of vendetta against the innocent simply because they are agitating for their freedom. Justice Binta Nyako wittingly threw her reputation into the mud instead of consciously repudiating such a task as an honor to her discipline and character. But the resolve of Biafrans remains obviously irrefutable. The Biafra restoration struggle must be driven gloriously to conclusion to the peace, freedom and fulfillment of the people no matter the price. Mazi Nnamdi Kanu's co-defendants so released, must maximally enforce and exercise their fundamental rights before the court of law as they remain innocent until otherwise proven. And for the fact that the Nigerian government woefully failed to indict them for almost three years during the period of their incarceration, they have absolutely proven that these resilient and courageous Biafrans have no case to answer before the kangaroo court of Justice Binta Nyako. She of course must strive to redemptively, imbibe the sterling qualities of civilised judges and essentially do the needful or be prepared to face the wrath of Biafrans globally. She must realize that President Muhammadu Buhari and the Attorney General of the Federation, though her kinsmen, cannot in anyway shield her perpetually. They too will have to account for their misdeeds someday. There can never be any other alternative way out of the woods than these. Long live United States of Biafra!! !